I’ve been itching to start bullet journaling for ages but couldn’t really think of a reason to. I love my personal Filofax for day to day planning too much to just abandon it and while I could just get some pages and set up the bujo in the Filofax I love decorating weekly pages and would miss it too much. It’s all Pinterests fault. It shows me all these pretty pictures of pretty set ups that I just have to have. I’ve had my Midori set up as something to throw in my bag for quite a while now and have been using it like a traditional notebook with a calendar in the front to stop any double bookings occurring. But to be honest, the calendar booklet was really the only part getting used. While on holiday though I decided to try a few layouts and do a bit of bujo-ing. I wanted a way to capture any random thoughts or tasks I had, with the intention of then transferring them either into my day to day planner, or my shop/blog planner if it was a blog post/product idea. I also wanted to do a bit of food logging as I’ve suspected for a while that there’s a few foods that don’t agree with me but I haven’t managed to pin point which ones as yet. I decided to use the middle book in my Midori which was the dotted insert from Travelers Times on Etsy. After browsing Pinterest endlessly I settled on a simple weekly layout. The three boxes underneath the date are to track certain pills I might take. The first column is for bujo logging and the second column is for food logging. I tried to spread them out a little more evenly in the second week so they filled the page more but still ended up with spare space at the bottom so just used that for anything for next week I wanted to make a note of. While I liked the touch of colour the washi brought I think I’ll be sticking to pen and pencil only. It’s been really handy to have something to hand at work or even at home just to jot little thoughts and ideas down. It’s meant I’ve forgotten a lot less blog post ideas! I’ve also been using the other notebook in the Midori (a cheap grid book from Ali Express) to do some shop brainstorming in bed at night too. 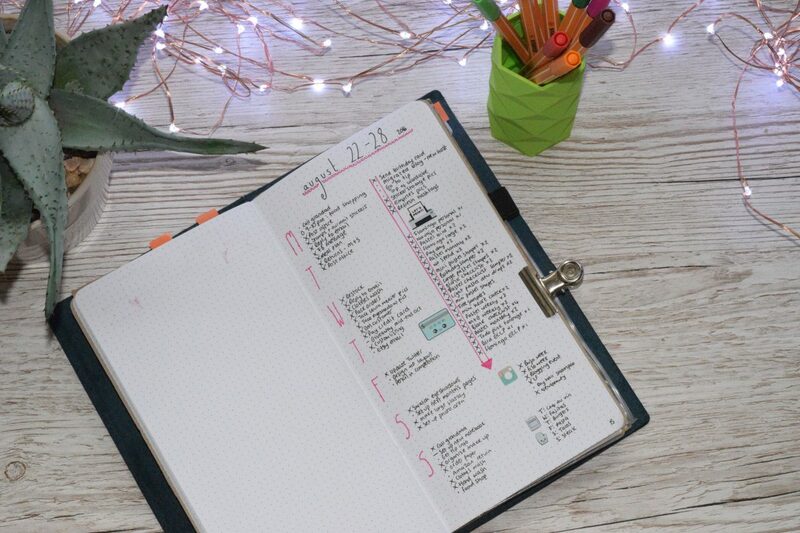 That is one thing the Midori has over a Filofax system – it’s much easier to write in! I’m not sure I like the food logging aspect, although I have discovered what I think doesn’t agree with me (yay). I also don’t like doing a weekly spread as if I miss a day or two (because I don’t have anything to note down) then I get annoyed with the waste and don’t like the blank space. I’m glad I had a little play with weekly layouts but I just don’t think they’re for me at the moment. Not when I use full weeklies in the Filofax. Instead I’m going to try something a little less structured and something that lends itself to being forgotten about for a couple of days. Something probably a little closer to a traditional bullet journal? More notebook than planner?